INNERLAND highlights fascinating unusual idiom. INNERLAND is a story about a journey. The travelogue of this journey reads like a voyage of a fragmented psyche through the paysage of dreams. 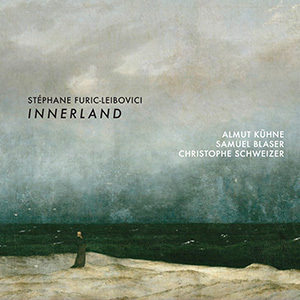 Entirely accoustic, INNERLAND was flawlessly recorded in one take at the famous Funkhaus Berlin, in Kammersaal (Saal 3) in July 2014. In this beautifully written composition in a traditional sense, Stéphane Furic - Leibovici borrows the arresting voice of Almut Kühne to tell us an eerie story: a tale of love, perhaps of a great lost love. It is an account of being lost in and wandering through the interior landscape of one's heart, searching for the path that leads back to the outside world.